North Kent Community Toastmasters installed Club officers for 2018-2019 in a ceremony officiated by Sienna Mavima, N Division Director (far right) at their June 19th meeting. 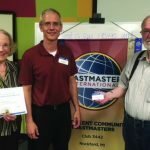 The Toastmasters International Club Year runs July 1st through June 30th. Members serve as Officers to hone their leadership skills while keeping their Club strong in membership, vital with educational goals, and supportive with a team effort. “North Kenters focus first on the individual’s needs, then on team spirit, and then our Club’s significance in our organization. Our new Pathways online platform gives each member an opportunity to select specific personal growth projects, while participating in a total team effort,” says Lynne Bradley-Horan, Club President. Our rewards flow into our business and personal lives. Officers pictured above are Dan Horon, Sargeant At Arms, Sheila Gillean, Secretary, Ron Musich, Treasurer & VP Public Relations, Audrey Creasy & Sue Popma, Co-VPs Membership, Dave Martella, VP Education, and Lynne Bradley-Horan, President. 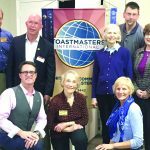 North Kent Toastmasters invite you to visit. Meetings are the 1st and 3rd Tuesday each month at 7:00 pm to 8:45 pm at the Bella Vista Church, 5100 Belding Road, Rockford. Follow the signs to Room 6. For more information about the club, please visit www.nkctm.org. Find them on Facebook and meet them on Meetup. 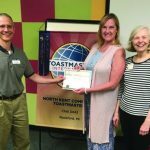 You’re Always Among Friends At Toastmasters – Where Leaders are Made!